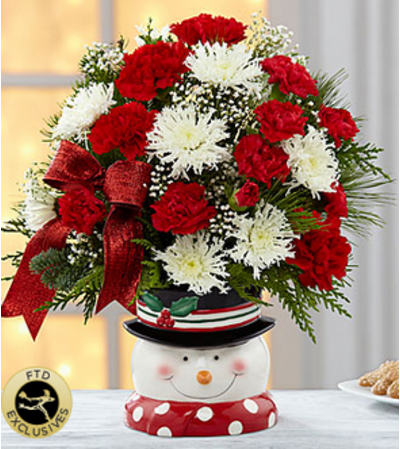 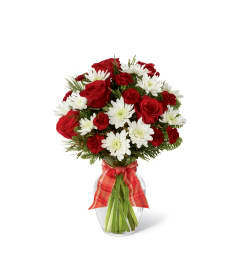 The FTD® Snowman Sensation™ Bouquet is blooming with frosty fun to create a bouquet blooming in holiday splendor! 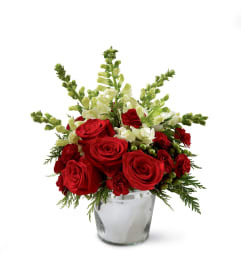 Bright red roses, carnations and mini carnations standout amongst a mix of snowflake cushion poms, baby's breath and an assortment of lush holiday greens to create an incredible flower arrangement. Presented in a sweet designer snowman-inspired ceramic vase, this mixed holiday bouquet is set to send your warmest season's greeting to friends and family in honor of the Christmas season.